From 1890 until 1913, Dean Conant Worcester (1866-1924) took thousands of photographs of people and places throughout the Philippines. Worcester had first traveled to the region as an undergraduate zoology major in the 1880s on a scientific collecting mission for the University of Michigan Museum of Zoology. He returned to the region after he graduated in 1890, this time making zoological collections for the Minnesota Academy of Natural Science. In 1893, Worcester was hired as a lecturer and curator in the University of Michigan Zoology Department and authored a number of scholarly and popular works on the Philippines. When the Philippines came under U.S. control at the end of the Spanish-American War in 1898, Worcester was recognized as an American expert on the region. He quickly rose to prominence in the colonial government, serving on the first and second Philippine Commissions and then as Secretary of the Interior of the colonial government, a position he held until 1913. Worcester’s fascination with the Philippines was coupled with his fascination and commitment to the relatively new technology of photography. During his time in the region, he and his employees in the Interior Department’s "Bureau of Non-Christian Tribes" took thousands of photos. A passionate imperialist, Worcester used many of his photographs in public lectures and popular articles supporting the colonial mission, and America’s responsibilities to "civilize" the tribal peoples of the Philippines. Others sought to be scientific records, framed through troubling 19th century racial classifications and evolutionary paradigms. Throughout his career in the Philippines, Dean Worcester was an avid photographer – using his photographs to document major political events in US-Philippine history and the activities of the Department of Interior, which Worcester directed from 1901 to 1913. In particular, large numbers of photos were produced under the Bureau of Non-Christian Tribes, a division of the Department of Interior created for the "investigation of the little known pagan and Mohammadan tribes of the Archipelago, the conduct of systematic work in the anthropology of the Philippines, and the recommendation of legislation in behalf of these uncivilized peoples" (from David P. Barrows, The Bureau of Non-Christian Tribes for the Philippine Islands, Circular of Information Instructions for Volunteer Field Workers , Manila, December 1901). 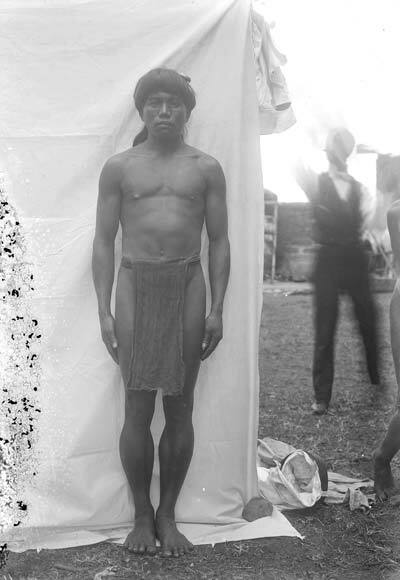 Modeled on the American Bureau of Ethnology and late 19th century racial and evolutionary typologies, the Bureau used photography as a critical tool in its "scientific" documentation of the peoples, material culture, and natural resources of the Philippines (Mary Jane Rodriquez, 2010, "Reading a Colonial Bureau: The politics of cultural investigation of the non-Christian Filipinos", Social Science Dilman 6:1-27). The history of human settlement in the Philippines extends back at least 30,000 years. Over succeeding millennia, diverse communities from Indonesia, southern China and elsewhere settled the island archipelago. Throughout their history, the diverse linguistic, ethnic and political groups of the many islands of the Philippine archipelago engaged in complex interactions with other regions of Asia. In the 16th century, portions of the archipelago came under the political control of Spain, and Philippine communities entered into sustained interactions with Europe and the New World.